PRAY-OUR GRANDSON R.G. WILL UNDERGO HIS 24th SURGERY TUESDAY! Please pray for our grandson R. G. Gray III. He will undergo his 24th surgery on Tuesday. 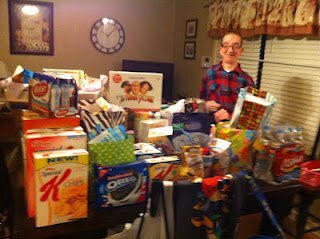 People from the church flooded him with gifts and he was happy. He is going to have what he calls his HANDSOME SURGERY. R. G. recently graduated from Pine Tree Special Ed High-School and will turn 21 on May 7. He has been such a blessing to all of us. He has the mind of a child, but has a great outlook on his life and life. He has a dog named Tanner and a job for him when he comes back home! GOTTA LOVE FAMILY! Pastor Dan Suttles is a 2005 graduate of TEXAS BAPTIST COLLEGE and has been pastor of LIBERTY BAPTIST CHURCH of Pigeon Forge, TN., for 6 years and is doing a wonderful job of reaching his community with the Gospel. The church has grown significantly since last year. The church celebrated its 45th year of existence on Sunday. God gave us 6 salvation decisions, 4 professions, and 1 baptism. I taught Sunday school, preached both services Sunday, and preached tonight at 7 pm. I preached my sermon “WHY YOU SHOULD BE A PERSONAL SOUL WINNER.” The altars were filled before the invitation was given. Tonight when I pulled into the parking lot at the LIBERTY BAPTIST CHURCH I noticed a big bus from LAKECREST BAPTIST CHURCH of Waterford, MI. Dr. Marc Dalton pastors that great church. He, his wife, and the seniors from their school were on a trip to Pigeon Forge, TN., and took time to come to the church service. This is a great soul winning pastor who pastors a great soul winning church. GOTTA LOVE SOUL WINNING CHURCHES!